Service, without activism, doesn’t capture King’s true radicalism. The fact that the Martin Luther King Jr. holiday is a National Day of Service bothers me. It bothers me perhaps even more than when I realized that, as a child growing up in Virginia, we didn’t have a King holiday. We celebrated “Lee-Jackson-King Day”—that is, Generals Robert E. Lee and Stonewall Jackson of the Confederate States of America, alongside Rev. Dr. Martin Luther King Jr. of the civil-rights movement of the 1950s and ’60s. But at least Virginia wasn’t pretending to care about King’s legacy. It’s one of the more unconscionable façades the United States maintains. Today, there is deep reverence for King—or for the King that makes Americans proud of their history. There is deep reverence for a message about love, peace, brotherhood and such easily appropriated themes. King is now an icon for colorblindness, which has become the overriding philosophy on how to deal with racism. No matter your political stripe, you pay homage to the man who was derided as an un-American communist agitator during his lifetime. In some ways, the commitment to depoliticizing figures of great historical importance in order to fit into the narrative of American exceptionalism is quite impressive. Think of how much erasure had to be done in order to have Reince Priebus honor a man whose life work was to dismantle the system of white supremacy and fundamentally alter the American way of life. We’ve come such a long way. Sure, every year journalists, activists, academics, and anyone who is committed to the idea of justice trots out their “the real MLK” quotes and articles and books, and we have a short memorial of what has been lost. We can all pat ourselves on the back for that. We are, in our way, doing the work of reclaiming King’s legacy. But the King holiday still remains a national day of service, and that is upsetting. Because it isn’t a day of service in the way King served his people and his country, by disrupting the status quo. It’s a day of service in which we’re all expected to lend a hand to the “less fortunate” in the grand tradition of charitable giving. We aren’t asked to write our congresspeople, in service, to implement a federally funded program for full employment, as King advocated for in the Freedom Budget. We’re asked to serve soup to the homeless. We aren’t asked to demonstrate in front police precincts, in service, to demand an end to police brutality, an issue King mentioned during that famous “I Have a Dream” speech, but is never brought up in polite conversation. We’re asked to read books to poor children. And I don’t mean to make it sound as if those charitable works are meaningless, particularly when so many suffer and whatever can be done to alleviate their pain, even momentarily, is surely welcome. But let us not pretend that we are honoring King when we are only assuaging our own guilt. King’s legacy lives on Ferguson, in Oakland, in Cleveland, in Chicago, in Boston, in New York City and everywhere else where young protesters are taking over highways and disrupting brunches and dying in at malls. Is it annoying some people? Yes. King annoyed people. He was one of the most hated men alive. You don’t get to be that way simply because you preach about loving your neighbor. He was hated because he was a threat to the American empire. He helped to expose America as perpetrator of violence against its own people. His tactics were unorthodox and they made millions of people uncomfortable. There weren’t great swaths of America welcoming the protests he led with open arms. There were police ready to beat, shoot, and kill if necessary to keep black folks in their place. For all the talk about progress, the tactics of suppression haven’t changed. 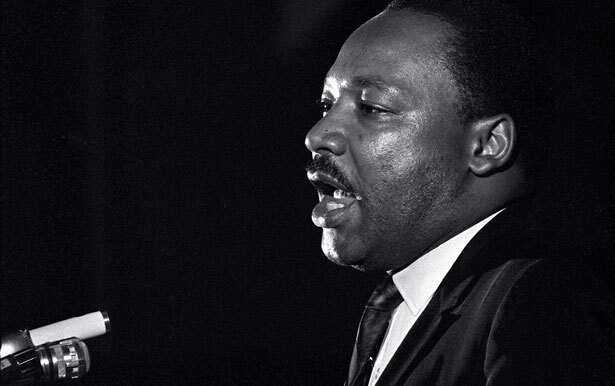 As a nation, we aren’t prepared to embrace the radical vision of King. We aren’t in a place where we are willing to sacrifice our national identity in order to see the true ideals behind King’s dream. The least we can do until we are is not pretend that our yearly call to service is somehow in line with his legacy. If we’re going to keep that up, we might as well all be celebrating Lee-Jackson-King Day.